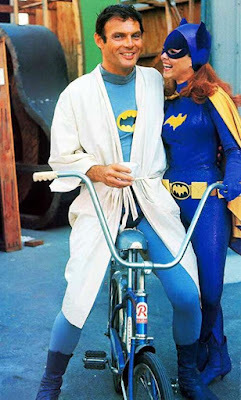 I like this behind-the-scenes photo because it's a happy reminder that West wasn't Batman, he was a working actor who played Batman for a couple of years and rode a Raleigh stingray around the studio lot between scenes. And got to hug Yvonne Craig. I had half a mind to write up something about Adam West, until NPR's Glen Weldon did it for me. It's worth a read. The Batman '66 series hit me at just the right time--as it did Weldon, whose age must be within a year or two of mine--to make a difference. I also ran around the neighborhood with a cape, looking for crime to fight. It's no exaggeration to say that West's Batman, along with the same era's Kirk and Spock, and the Mercury, Gemini and Apollo astronauts, were as important to the development of my interests, personality, and approach to life as people who actually raised me. West was an indispensable ingredient in my primordial soup. I'll always treasure West's performance for one thing: I took it deadly seriously when I was a child and only realized it was a comedy when I was a teen, when I loved it all over again. I've never seen anything work on two levels as wonderfully as that. (Maybe "Peanuts," which is funny when you're a kid and melancholy when you're an adult.) For a long time, comic book readers and fans dismissed West's Batman for mocking the medium, and we still suffer through every newspaper headline about comics beginning with a "Pow!" and "Bam!" But the show was so smart and charming that opinion eventually turned, and West ended his life as a celebrated pop culture icon.